I've been searching through lots of examples of weekly cleaning schedules to find something that will work for me and our home. In the end, I came up with a checklist of daily and weekly tasks that addresses our biggest needs in our home. I hope to work on a quarterly/yearly list in the near future, but if I can keep it up, this list should keep things running smoothly on a daily basis. I have changed some of the tasks to be a little more general on the printable cleaning list that I'm sharing today. You can click the photo below to download the aqua version or click here to download a yellow version. I laminated my list and hung it on our refrigerator, so we can mark the tasks off with a wet erase or dry erase marker each day and throughout the week for the weekly tasks. I would love a template too since we will have a newborn soon and I would like to make it for different chores. Thank you! Hi Ladies! 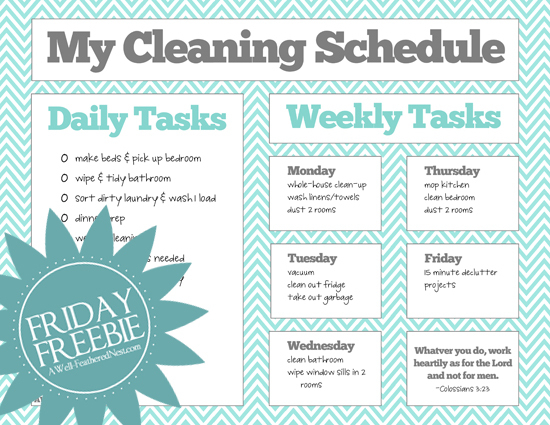 I shared this free version of my cleaning schedule some time ago that already has chores listed. I have a blank version in the planner add-on set in my shop where you can write in your own chores. I hope to have a version available soon that will be editable, so the chores can be typed in before printing the chart. This cleaning schedule has been very helpful to me. I found it a challenge to organize my time at the beginning of last year when I became a stay at home mom, when my second child was born. I really enjoy your blog and appreciate the time you put into being a resource to other homemakers.